When Sensex was crashing massively, there were some scrips that managed to hold on to the gains. Though such scrips are tiny in number, there are some that swam against the tide. None of them happens to be an index constituent, but are the 'Group A' stocks on the BSE. Bombay Dyeing shares, for instance, surge by 3.78% to trade at Rs 234.9 on the BSE. Also, Religare shares jump 5% to trade at Rs 43.15 on the BSE. VIP Industries shares rise 4% to trade at Rs 352, while Oil India Ltd rises 3.7% to trade at Rs 348. Aegis, Bajaj Finance, Bajaj Electricals, Pfizer and NIIT rose by 3.53%, 3.48%, 2.77%, 2.71% and 2.65%, respectively. Other shares that are rising on Tuesday include Jet Airways (2.63%), PVR (2%), Century Textiles and Industries (1.59%), Apollo Hospitals (0.63%), Mind Tree (1%). Some more shares in green are Cadila Healthcare, GSPL (Gujarat State Petronet), Emami, NIIT Technology, Bajaj Finance, IPCA Laboratories, Cummins India, Syngene International and Sundram Fasteners and Balkrish. Sensex closed at 34,195.94, 1.61% down. Similarly, Nifty closed at 10,498 points, 1.58% down. Only one Sensex stock Tata Steel closed in green. It closed marginally higher at Rs 664.95 on BSE. The Sensex and Nifty suffered a decline Tuesday, tracking a selloff in global equity markets. Overnight, the Wall Street suffered its biggest intraday fall in history. The Dow Jones Industrial Average (DJIA) ended with a loss of about 1,200 points - nearly 4.6%. Shares in other Asian markets were also under strong selling pressure, with Japan's Nikkei down about 5 per cent. 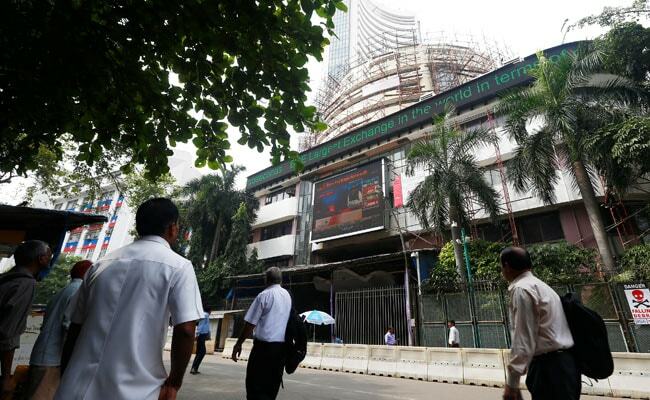 The Sensex fell as much over 1,200 points to 33,482 while Nifty tumbled below 10,300. The rupee also fell to 64.39 against US dollar, as compared to Monday's close of 64.06. In afternoon trade, both Sensex and Nifty were off days lows.